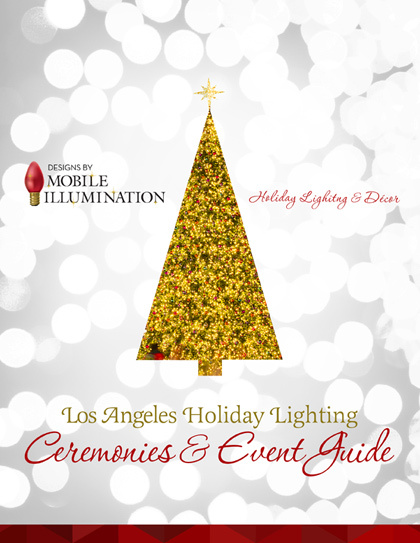 Mobile Illumination is pleased to present our annual edition of The 2016 Los Angeles Christmas Lighting Ceremonies and Events Guide. Every year in this guide we compile the most exciting and family-friendly Holiday events that take place in and around Los Angeles. Our clients love this convenient tool and use it to plan their Holiday-inspired family outings during the Season. We at Mobile Illumination, a professional Christmas lighting and Décor company, feel special joy knowing that all properties featured in this guide were made Holiday ready by our expert crews. In just about a month they installed dozens of Holidays wreaths and many miles of garland, hung millions of festive lights and decorated countless trees, rooflines, and entryways. Please review this guide and see for yourself all the destinations, lighting ceremonies, and other festive events that will be taking place to make this Holiday season just a little brighter, a lot more fun, and absolutely magical for everyone to enjoy. Fun with Holiday Lighting and Décor. Spring is coming! 5 ways to prepare your restaurant for springtime.